So if you've been reading JazzWrap for awhile you will know that I don't throw around comparisons to Esbjorn Svesnsson Trio at all. I've always felt that E.S.T. were a cut above every other modern trio of the last decade. Esbjorn Svensson was a magnificent pianist and is deeply missed. 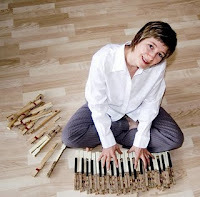 I recently started listening to Icelandic pianist Sunna Gunnlaugs and I have been convinced that she could be one of the few pianists that might ascend to Svensson's heights. While influences of Keith Jarrett and Bill Evans are well noted, there is an Eastern European element to writing and performance that add another layer of beauty and romanticism that will definitely connect with listeners. In the same manner as the earlier Esbjorn Svensson recordings. Gunnlaugs had studied and performed in New York in the late '90s before returning to Iceland. The experiences of growing up near/with Scandinavian influences as well as being apart of a multi-dimensional scene in New York is definitely captured in Gunnlaugs recordings. On her most recent (sixth in all) album, The Dream (Sunny Sky Records), Sunna Gunnlaugs makes the perfect connection of intimate lyricism with buoyant melodies into exciting and sophisticated listening experience. "Holding Ground" has a wonderful hard bop sensibility to it. Her movement on the keys has shown a definite New York influence. For me it felt like being at Smoke listening to Harold Mabern or Mulgrew Miller (something I do quite often actually). Gunnlaugs playing moves between delicate compositional structures and free form improvisations (as shown on the five interludes "Spin"). That European influence can felt on "Vitjun" in which Stillman and Gunnlaugs both deliver beautiful harmonies that give the piece a lush chamber music quality but somehow never feeling distant. "Tunnel Vision" has become one of my favourite tracks on the album. Eivind Opsvik and Scott McLemore (also a member of ASA Trio) open with a very exquisitely played improvisation before Gunnlaugs and Stillman join in to create a bold well enclosed piece with each member stretching the parameters. "Korn" is yet another astounding combination for me that conjures both Icelandic, European and American themes. Gunnlaugs playing dominates this closing number as expected but it also features Opsvik accompanying her with terrific shapes and patterns on the bass. In The Dream, Sunna Gunnlaugs has created a work that is reminiscent of early E.S.T. albums. It is the sum of influences but she uniquely stretches those influences into something wholly different. Gunnlaugs has moved from strength to strength with The Dream and it is her best record to date. If you are looking for something rewarding, exciting and combining some of the best playing you might hear all year on piano, The Dream is a great document to start with. Absolutely Brilliant!